With a rich history spanning over 800 years, the Louvre is perhaps the most important location in the art world as we know it. Situated on the Right Bank of the Seine, the Louvre Palace previously served as the official residence of the French monarchy, before opening its doors as a national museum in 1793. Home to Leonardo da Vinci’s Mona Lisa, the famous Venus de Milo, and the Nike of Samothrace, the Parisian institution is the world’s largest and most visited museum, attracting around 15,000 people each day. For many, the Louvre is not just a symbol of French history and culture, but also represents the very finest the global art world has to offer, spanning centuries and continents and inspiring the great artistic minds of the future. And yet, despite its status as a global cultural authority, 2017 is shaping up to be a testing year for the Louvre. The museum reported a significant drop in visitor numbers in 2016, with fears over terrorism keeping tourists away from the French capital. As the Louvre attempts to reverse these fortunes at home, it is also working in partnership with 16 other French cultural institutions to establish the Louvre Abu Dhabi, an independent institution formed as part of an intergovernmental agreement between Abu Dhabi and France. Rumoured to have cost over $108m (€97m) to build, the Louvre Abu Dhabi was originally scheduled to open in 2015, but its debut has been repeatedly delayed. “The same debates over legitimacy, purpose and impact that arose when the museum was announced in 2007 are bound to resurface in 2017”, said Maymanah Farhat, art historian and specialist in modern and contemporary Arabic art. Indeed, the project has attracted controversy, but it is also admirably ambitious in its aims, promising to highlight universal themes in eastern and western art, and to encourage dialogue between cultures. As its opening date approaches, the Louvre Abu Dhabi might mark a new chapter for the iconic institution. Boasting a uniquely elegant cityscape and chic café culture, the city of love has firmly established itself as one of the world’s most popular destinations. However, a spate of tragic terror attacks in Paris has dented the city’s popularity, with the French capital reporting an 11.5 percent decline in foreign visitors in 2016. This slump in tourism has had a knock-on effect on the city’s cherished cultural institutions, which rely on tourist visits for much of their revenue. The Louvre itself saw a 15 percent drop in visitors in 2016, finishing the year with a loss of €9.7m. Instead of the 10 million visitors the museum had hoped to attract, the Louvre welcomed just 7.4 million guests in 2016, as fears over terrorism weighed heavy on tourists’ minds. A further three years of decline would prove hugely detrimental to the Louvre, where foreign tourists make up over 70 percent of visitors. In a drastic effort to combat falling museum attendance, France has revealed the largest cultural budget in the nation’s history. The French Government will increase culture spending by 6.6 percent in 2017, taking the budget to an impressive €2.9bn. According to former French Minister of Culture Audrey Azoulay, a significant portion of this fund will be set aside to bolster museum security. The Louvre may be encountering significant challenges at home in France, but this has not stopped the museum’s desire to help establish new institutions overseas. This year marks the grand opening of the brand’s first permanent international affiliate, the long-awaited Louvre Abu Dhabi. The groundbreaking new building will be home to more than 620 fine artworks, including originals by da Vinci, Monet, Manet and Picasso. Spanning ancient masterpieces to modern installations, the museum is centred around a theme of universality, showcasing a cross-cultural, shared human experience. This desire to encourage openness and dialogue between cultures is reflected in the museum’s sleek design. Created by award-winning French architect Jean Nouvel, the museum combines modernity with traditional Arabic architecture, taking inspiration from the region’s souqs and low-lying settlements. Inside the museum, efforts have been made to allow visitors of all backgrounds to enjoy the artworks on display. Signs and labels will be written in Arabic, French and English, while sensory stations and braille textured panels will allow guests with visual impairments the opportunity to experience the collections on display. As part of the Saadiyat Island cultural project, the Louvre Abu Dhabi hopes to transform the city into a global cultural capital, drawing international visitors from across the globe with its unique exhibitions and impressive permanent collections. For the Louvre as a brand, meanwhile, the multimillion-dollar project strengthens the museum’s authority in the global art world, reaffirming its cross-cultural appeal and introducing a more globalised outlook for the iconic French institution. 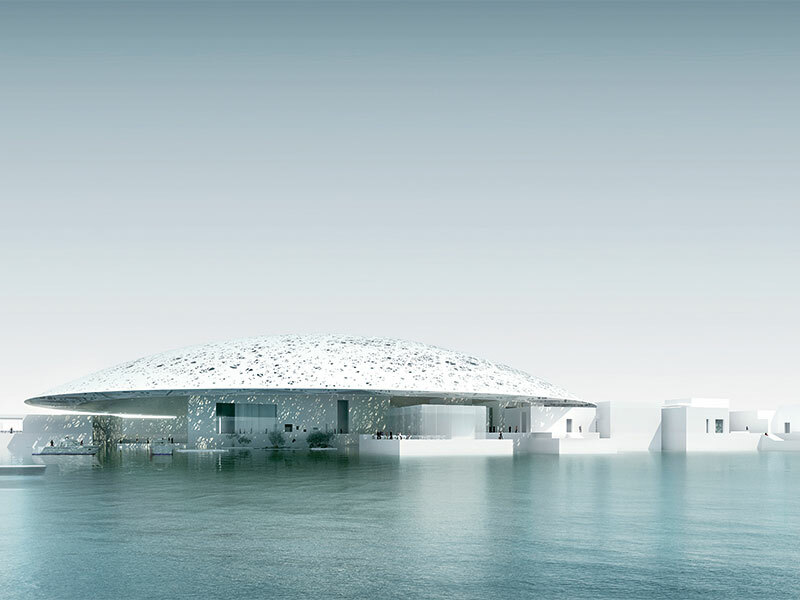 Since the plans for the Louvre Abu Dhabi were first revealed to the public in 2007, the project has been a subject of controversy. Over the course of the past decade, the art world has collectively scrutinised the motives behind the deal, with several industry experts suggesting the French Government and the French arm of the Louvre stand to benefit far more from the project than their Emirati counterparts. In addition to shouldering construction costs, the UAE has agreed to pay $525m to be associated with the Louvre name for 30 years and six months. What’s more, it will also pay a cool $747m in exchange for art loans from French institutions, temporary exhibitions and management advice. Between 200 and 300 artworks will be rotated through the Louvre Abu Dhabi during the first 10 years of its life, prompting pushback from critics who accuse the French Government of selling its cultural heritage. Indeed, just two years after the initial France-UAE cultural deal, the former opened a military base in Abu Dhabi, its first permanent base in the Gulf region. Political agreements such as these have further fuelled anxieties France is exploiting its culture for economic gain, and have prompted wider debates over the commercialisation of heritage and artistic tradition. While the French Louvre has come under fire for its motives in this deal, the yet-to-open Louvre Abu Dhabi is also facing criticism for supposedly ‘importing’ culture. By bringing in works from famous French institutions, the museum has been accused of catering to a western audience, prioritising the tastes of tourists rather than looking to attract local visitors. Responding to this criticism, the Louvre Abu Dhabi has assured potential visitors that the UAE’s own culture and heritage will indeed be showcased and celebrated in the museum. As such, the Louvre Abu Dhabi will also receive artworks and artefacts from established UAE cultural institutions in order to complement the works loaned from France. The museum has no intentions of being a direct replica of the original Louvre, nor is it exclusively focused on art from the Arab world. Here, the vision is cross-cultural, spanning histories and continents in order to weave a unified human story. The Louvre Abu Dhabi has so far managed to successfully rebuff critics’ initial scrutiny of its motives and intentions, but the upcoming museum now has another PR problem to contend with. In December 2013, The Guardian published an in-depth exposé detailing alleged human rights abuses committed against migrant workers involved in the construction of the Saadiyat Island project. According to the reports, workers tasked with building the new Louvre and Guggenheim museums were being routinely exploited, forced to live in sub-standard conditions and charged extortionate recruitment fees in order to secure jobs at the project. The Guardian discovered construction companies were withholding the passports of migrant workers, many of whom had travelled from South Asia, effectively trapping them in the UAE. Given the renting of the Louvre name is one of the central components of the France-UAE deal, it is of utmost importance that the project enhances the museum’s international reputation. Any damage to the Louvre brand would prove extremely detrimental to both parties, showcasing the high risk factor of museum franchises. As such, the Louvre Abu Dhabi has been working to prioritise worker welfare as construction nears completion at the museum. Such brand image issues are a common feature in international artistic alliances, and one of the principal risks of launching and managing satellite museums. Simply put, what works in one location may not work on foreign soil, despite the employment of a reputable brand name. To make matters more complicated, the home nation and the selected overseas destination often struggle to reconcile their contrasting cultural priorities, resulting in the cancellation or postponement of planned collaborative franchises. The never-realised Guggenheim offshoots in Guadalajara, Rio de Janeiro and Tokyo demonstrate the difficulty of achieving successful foreign franchises, even for established and well regarded institutions. For many, these misadventures suggest museums enjoy greater success when they emerge organically and showcase the relevant cultural heritage of their home nations, in the spirit of Spain’s Reina Sofía or the Netherlands’ Rijksmuseum. Rather than basing their institutions around foreign collections, these popular destinations instead celebrate their countries’ own rich artistic heritage, routinely attracting hordes of local and international visitors keen to immerse themselves in a particular culture. And yet, as the art world grows accustomed to a pattern of failed franchises, the Louvre Abu Dhabi looks set to buck this trend. Unlike the fruitless franchises of years past, the Louvre Abu Dhabi is the product of a strong shared vision between France and the UAE, and benefits from a coherent cultural identity. Far from attempting to replicate the Louvre Paris, the Louvre Abu Dhabi will instead serve as a meeting point, uniting artworks from different ages and cultures under a profound, universal narrative. “The Louvre Abu Dhabi will act as a catalyst for cultural interaction, and will offer the opportunity to gain a new perspective on the history of mankind”, said Rabaté. With its doors set to open later this year, art critics and analysts worldwide are now waiting with baited breath to see what the future holds for the Louvre. If the Louvre Abu Dhabi succeeds in its cross-cultural vision, then the Louvre brand could well emerge as a symbol of openness and inclusivity for the art world of the 21st century.